An Absence of Fit ← You Want Me To Wear What? Reader and Classics Scholar Emily sent this to me; she somehow managed to find time in her studies to surf the Forever 21 site. Can someone please explain to Forever 21 that they need to stop trying to pass off bad fits as fashionable? 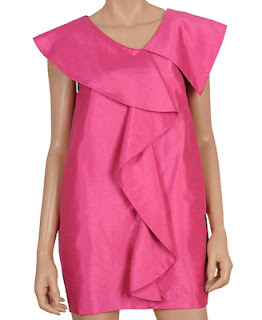 This dress is a giant pink sack with some extra fabric tacked on. Sorry, I just don’t believe that the absence of fit qualifies as a style choice. Because that’s what this is: the absence of fit. It’s not like this is a loose-hanging dress, flapper-style or something. This is a dress that has no fit to it. It’s just two panels of fabric sewn together. The worst part is, I actually really like the ruffle running down the center. I like that it lays flat on itself, and that it only has four folds in it. I even like that it appears to wrap around the neckline – it’s not something that I’d wear, but it is interesting. Had this dress been fitted properly, it might not have found its way onto this blog. But no. Instead, it is a dress that completely lacks any fit. It is the singularity of fit. And for that, this dress is found wanting.